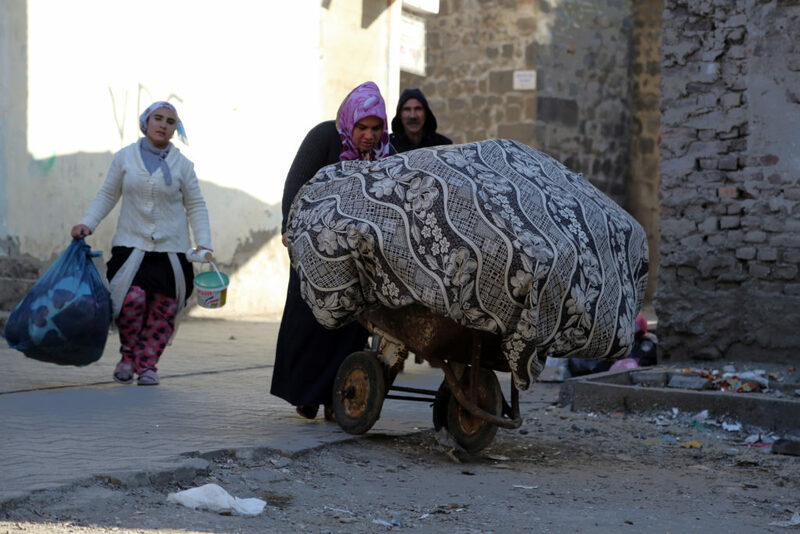 A family leave the Sur district in Diyarbakir (Amed), Turkey, after heavy assault by the Turkish military. Source: AP Photo/Murat Bay. Abdullah Demirbas was born in 1966 in the city of Diyarbakir (or Amed), Kurdistan. From 2004 until 2012, he served as mayor of Diyarbakir central Sur District, which has been largely destroyed in recent months by Turkish military assault. While news of Sur’s destruction spread globally via social media, its profound cultural and historical significance is less widely known. For thousands of years, Diyarbakir has stood as the cosmopolitan heart of the Mesopotamian region. Sur is the city’s oldest neighborhood, with official records dating the city back over 3,000 years. However, local experts suggest that it is far older. Before its destruction, Sur was a lively and colorful place with narrow streets, cool shade, thick stone walls, narrow passageways, and luxuriant gardens. As a richly articulated living history, Sur shattered the stereotype of the Middle East as intellectually backwards and culturally empty. During his tenure, Demirbas led social and cultural projects to renew Sur and preserve not only its material and architectural legacy, but also the livelihood and culture of its inhabitants. He helped establish the Council of Forty, a multi-faith forum across Amed’s religious communities, as well as a civil monument to the Armenian genocide, the only one of its kind in Turkey 1. In 2012, Demirbas was forcibly removed from office and arrested for using the Kurdish language in a municipal proceeding. Earlier this year, he relocated from Amed to Istanbul, where he teaches philosophy and politics in a local public school. In the following interview, Demirbas and I discuss the history of Sur, as well as the recent waves of state violence, repression and the threat of civil war in Turkey. This was conducted remotely over two sessions and with the help of a translator. The text is edited in some places for length and clarity. Can you tell me about Amed before 2004? When we (the BDP) took over in 2004, Amed was not in very good shape. It was actually a devastated, abused place. But during those ten years time, we did much restoration of churches, mosques, and synagogues for example; including an Alevi mosque and a Yazidi temple. We made plans to preserve Sur as a whole, which had never been done by any previous governments or mayoralties. Our plan was to rebuild Sur as it was before the 1930’s, with close resemblance to the original. As part of this merging of Diyarbakir’s many cultural roots, we also constructed multicultural institutions. While we were doing all of this planning and reconstruction, we also paid close attention to our own democratic values and made sure that people were joining in and giving their opinions on these issues. We asked the people, we asked the NGOs, as well as the architects’ chambers and stakeholders in related fields. So we went to the Council of 40, and we made the plans in full consultation with them. Say more about the Council of Forty? This is a religious council? Yes, that’s right. This is a unique council in Turkey. Gender equality and ethnic and religious equality are its ruling principles: so there are Armenian, Syrian, Kaldani, Alevi, even Turkmen representatives among its different contesting views. If we have to summarize, we were trying to make Sur reflect its own historical roots, because it is estimated that Sur is historically over eight or nine thousand years old and that over thirty-three different cultures have thrived there. 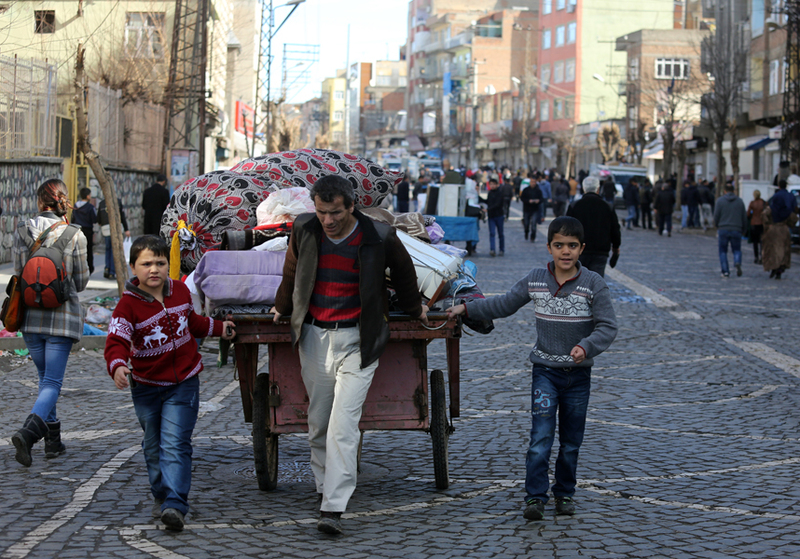 Sur is the largest part of Diyarbakir, making Diyarbakir a multi-cultural, multi-identity, and multi-vocal city. But this remarkable diversity was denied at the foundation of the Turkish Republic, which consists only of a single nation, with a single language, and a single religion. So we wanted to rehabilitate all of these diverse fragments which have been under the shadow of destruction and keep them alive for the future. It is estimated that Sur is historically over eight or nine thousand years old and that over thirty-three different cultures have thrived there, making Diyarbakir a multi-cultural, multi-identity, and multi-vocal city. But this remarkable diversity was denied at the foundation of the Turkish Republic. The philosophical aspect to this is the belief that the world is a flower garden; and that there are different flowers, different colors, different shapes; that we have to “live and let live” in that world. That’s our perspective, and we wanted to make it a reality. We also wanted to give a model of peace to the Middle East, because the Middle East is constructed of different linguistic, religious, and racial groups. We plan to make Diyarbakir, and especially Sur, the center of Middle Eastern peacemaking. How did the monument to the Armenian Genocide come about? We constructed a monument marking the genocide for the first time ever in Turkey, in 2013. In our opening speech, we declared that we are sharing in the pain of the genocide, to ensure that it won’t be lived ever again. In order to rule, the Turkish state has pushed different religions and different ethnicities one against the other, in an approach based on divide and conquer. However, our view is that there have been mistakes in the past, and we have to face up to these mistakes, apologize for them, and look forwards together. We know that some of our ancestors, Kurds, during the Armenian genocide, were used as tools in these massacres by the Turkish state. We apologized by constructing this monument, and we asked the Turkish state to apologize to Christians, Armenian Christians, Assyrian Christians, Yezidi Kurds, Jews and Alevi, and also Muslim Kurds as well. If we can face the past correctly together, we can face a true future together, and we can live together. That’s the reason why we built the genocide monument. How did the municipality address the liberation of women? For the first time in Turkey, we introduced female management and a Council of Women as well within the municipality. As we say, women are half of life, so we want to have women joining in life in their freedom. Because women are half the population, we want them to take their rightful place. For the first time in Turkey, we introduced female management and a Council of Women as well within the municipality. As we say, women are half of life, so we want to have women joining in life in their freedom. While I was running the administration of Sur, in 2005, we made a decision that if a worker of the municipality is abusing his wife, the city will cut the salary of the man, giving that sum directly to the female partner. If he then continues to abuse his wife, we asked him to vacate the job, replacing him in that post with his wife. If the man has two wives, we fire him and give the position to the first wife. We also gave salary bonuses to parents who educated their daughters in school. We believe that in order to fully achieve women’s freedom, they must also have their own economic freedom, so we launched projects that brought women into the labour force. One of these projects is the Tandoori house project. In houses constructed by the municipality, women were making Tandoor bread, and they were making a living selling this bread to the market and shops. We also promoted the cultivation of tomato, peppers, and eggplants on the rooftops of people’s houses, where women could harvest them once they were dried in the summertime. We did this in order to introduce a system of organic agriculture, using the original seeds of these products as the basis for a seeding program. What is happening now in the war that is raging in Turkey? The ‘peace process’ came to an abrupt end last April, and as a result there is a huge conflict going on right now. Turkey is on the verge of civil war. Erdogan plans to be not only president but sultan in Turkey, and because the HDP (Peoples’ Democratic Party) 2 crossed the election threshold on June 7, this impeded Erdogan’s path toward the presidency and the sultanate. So he began a war of vengeance. The bombing of the Diyarbakir meeting just before the June election, the bombing of Suruj, and the murder of the two (Turkish) police officers, these were the triggers of the war. Because there were no third-party observers, the two sides do not trust each other and a civil war has broken out in the streets. But we are now discussing the answer more than the question, and it is worth talking about the question. This is the century-old Kurdish question and the whole challenge for democracy in Turkey. The government’s main strategy for Sunnizing the country, for creating a Sunni Muslim state, depends on expanding the war. Because of his dream of dictatorship, Erdogan has started a civil war. But we are now discussing the answer more than the question, and it is worth talking about the question. This is the century-old Kurdish question and the whole challenge for democracy in Turkey. The government’s main strategy for Sunnizing the country, for creating a Sunni Muslim state, depends on expanding the war. Because of these dreams of dictatorship, they have inflicted great suffering on the people, on society and the environment. Already, over 300,000 people have had to relocate. Most of the cities’ structures and infrastructure have been destroyed. In Cizre and Diyarbakir, many world heritage sites have been totally demolished. The socio-economic balance, which was already very out of kilter, has been totally upended again. We can sum up: that because of his dream of dictatorship, Erdogan has started a civil war. Did the PKK set out to break with the peace process and what role did Abdullah Ocalan play in the ensuing conflict? From the beginning, because there was no third party observer, neither party trusted the other. Now that the process seeking a solution has not only unravelled but become an “un-solution” process, the PKK has increased its attacks and its violence. Mr. Ocalan has been in solitary confinement since April 2015, such that not even his lawyers can visit him. So he’s out of the picture. And this is one reason for the violence, because he cannot intervene to stop it in its tracks. When Mr. Ocalan was included in the negotiations, all of the violence was stopped. When the Turkish state ceased meetings with him, and isolated him, violence with the state increased. We might well conclude that if he were still involved in the solution process, this violence would not have happened. So it is our wish to see him involved in this process again. How do the EU and US regard this isolation of Öcalan? Currently they have not objected to it other than very feebly. Because of public pressure, the CPT delegation (the Committee for the Prevention of Torture, Council of Europe) met with him at the end of April, but there has been no press announcement to that effect so far. And they only went to see his conditions, not to involve him once again in the peace process. The US has not acted as a mediator in this process, yet the US is the only actor who can be effective in this role. The US should step forward, because the development of peace and democracy in Turkey will initiate stability in the Middle East region as a whole, and things will go much better for the different ethnicities and beliefs trying to live together in harmony in the Middle East. The Kurds and Mr. Ocalan advocate diversity and multiculturalism, multi-racialism, multi-religious-ism, and real secularisim. But the current state in Turkey is radically Islamicized and Turkified. They have supported at various times, ISIS, Al Qaeda, and other Islamic extremist groups. This scares the Shia, Armenians, Jews, Christians, and Alevi, who only number 600 of those who are left, as well as other ethnic and religious minorities, because the current Turkish state does not tolerate difference. So our wish is that the EU and US should pressure Turkey into restarting the peace process again. For the past century, Turkey has had this problem. And the reason for this is Turkey’s official ideology, which holds that everybody in Turkey is a Turk; their language is Turkish, their culture is Turkish, and they are all Sunni Muslim, so that all cultural and racial and religious differences must be obliterated. In the last period of the Ottoman Empire, even Iranians and Assyrians were targets of genocide. After that, in the Republic, they started on Kurds in Dersim and the Republic of Agur, because these were the people who were rejecting this monocultural, unitarian identity. They had to be destroyed, even without any open rebellion, just because they declared that they were not the same. None of these problems have ever been solved. In your view, what is the solution to the current situation? First of all, we should have a new constitution which is liberal, democratic, and for universal civil rights in Turkey. In this constitution, all the different ethnic and religious and gender-based differences should be accommodated. Everybody should have the right to be educated in their mother language. All the religions and beliefs in Turkey should have the right to be represented openly. The protectorate system, which is only deployed in Kurdistan, should be abolished, and the state should face up to its past, its bloody history, and apologize to the Armenians, Assyrians, Greeks, Kurds, Jews and Yazidi, as well as the Alevi Turks. In fact, such a new constitution would also be seen as meeting the EU’s constitutional demands. We ask the intellectual community, academicians, and the whole of international public opinion to pressure Turkey both institutionally and culturally to stop this violent process and return to peace. . The final thing to say is that we ask the intellectual community, academicians, and the whole of international public opinion to pressure Turkey both institutionally and culturally to stop this violent process and return to peace. We invite them to support our policies of environmentalism and gender and sexual equality, because it is our firm belief that especially female independence is the main bulwark of freedom in society. Moreover, multilingualism should find favor in every state. Eleanor Finley is a board member of the Institute for Social Ecology. She has a background in feminist activism and was a participant in the Occupy Wall Street Movement. Eleanor is a graduate student in anthropology at the University of Massachusetts, Amherst, where her research focuses on social movements, environment, and energy in Europe. She is currently conducting action-research within the Spanish anti-fracking movement, and interns with Environmental Justice Organizations, Liabilities and Trade (EJOLT) at the Autonomous University of Barcelona. This article was originally posted on openDemocracy. The monument has since been destroyed. HDP and BDP share the same ideology and are allied. However, HDP functions at the national level, while BDP is focused on the North-Kurdistan region.